20 points. That's how many points the Colts defense has given up over the last three games (vs. Texans, vs. Chiefs, vs. Jaguars). Had it not been for a true garbage time touchdown by the Jags, the Colts would've surrendered just 13 points over a three-game span. To put it in perspective, consider how the Colts gave up 38+ points in three games this year (38 vs. Rams, 40 vs. Cardinals, and 42 vs. Bengals). 17 points. That's how many points the Colts scored in the first quarter this week. It's in stark contrast to the losses mentioned above, when the Colts failed to muster a touchdown in the first quarter (they scored a field goal in the first quarter of the Cardinals game). 1,083 yards. T.Y. Hilton had a monster game, catching a career high 11 passes for 155 yards. He also finished the season with 1,000+ yards for the first time in his career. During the current three-game winning streak, Hilton caught 24 balls for 285 yards. The Colts offense worked itself into an awful funk after losing Reggie Wayne, and other teams focused on keeping the ball away from Hilton. The Colts made adjustments and emphasized getting the rock to No. 13. And why didn't you do that earlier? The Colts came into the season hoping to pound the ball. They kept pounding. And pounding. And pounding. It was like hitting your head repeatedly against a wall after Reggie Wayne went down. They finally adjusted, running more spread looks with an uptempo pace. Since the second half of the Bengals game, the Colts offense has looked completely different. GRIFFNAAAAAAATION! Another touchdown for Griff Whalen this week, who has found the endzone twice in the last three games. He didn't have a great game--just 4 catches for 32 yards--but he has emerged as a reliable target. Why Matt Hasselbeck tried to kill him with a pass over the middle in the fourth quarter is anyone's guess. That could've been a scary play. Two more sacks. Robert Mathis further cemented the best year of his career with a pair of sacks against the Jags. He finished the season with 19.5 sacks and should get consideration for Defensive Player of the Year. He is the Colts' lone Pro Bowl representative. Early turnover. The Colts forced an early fumble by Maurice Jones-Drew, a play that set the tone for the game. Was it a fumble? Was the ball out before his forearm hit the ground? I have no idea. I half expected the officials to award the Jaguars a touchdown out of spite, given the Colts' recent bad luck with official reviews. Another big game. After putting together a phenomenal game last week, Jerrell Freeman had another great week, finishing with 8 tackles, a sack, a tackle for loss, 2 passes defensed, and a pair of QB hits. He was, again, everywhere. Solid Butler. Darius Butler recovered a fumble and finished with 8 tackles. It seems like this guy's always around the ball. Over the last three weeks, he's been a big part of the defense's resurgence. Some injuries. The Colts had something to play for this week with the possibility of improving their seeding in the AFC playoff picture. No resting this time. No "build a lead and throw in Painter." Still, starting the regulars has its risks. Vontae Davis left the game with a groin injury. Bjoern Werner and Aubrayo Franklin also left after getting hurt. I hope the injuries weren't serious. The running game. It was far from spectacular, as the Colts finished with just 80 yards on 28 carries (a 2.8 average). Both Donald Brown and Trent Richardson had rushing touchdowns in the first quarter. ODDITY ALERT: Richardson had a better average than Brown (3.1 vs. 2.6) . The turnover battle. The Colts forced two turnovers: a fumble by MJD and an interception of Chad Henne by Antoine Bethea. The interception came at a key point late in the second quarter. If the Jags scored on the drive, it would've been a 17-10 ballgame. Instead, Bethea picked off the pass and the Colts drove down for a late field goal to make it 20-3 at halftime. Big swing there. Air Donald. Loved Donald Brown's fearless plunge into the endzone on the Colts' first possession. He wasn't going to let anyone keep him out. Going for it. Chuck Pagano showed, for better or worse, that he's willing to roll the dice. The Colts clearly wanted to put this one out of reach early, so on fourth and goal from the two, they went for it. Trent Richardson powered his way to the score with some good blocking from the offensive line. Better protection. The Colts' switch to a spread/short passing/uptempo offensive philosophy has paid off. Even with constant juggling of the offensive line, Luck has been sacked three times in four games. Think about this: in a three-game span that included games against the Texans, Rams, and Titans, the Colts gave up 12 sacks (they managed to win two of those three games, despite surrendering five sacks to the Titans). Efficient day. 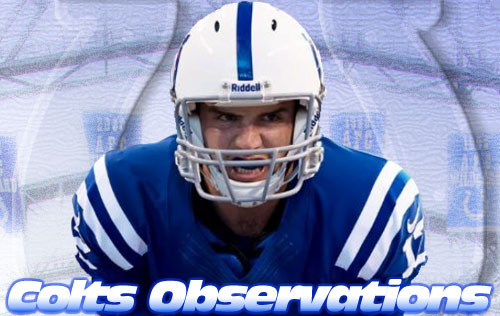 Andrew Luck wasn't flashy; he hardly ever is. Still, he completed 70% of his passes and threw for 282 yards and a TD to Griff Whalen. He had a couple close calls--including one in which he tried to squeeze an endzone pass for Hilton between two defenders--but took advantage of great field position and seemed to find Hilton whenever he needed a third down conversion. The Colts were 8-16 on third down. Playoff momentum. It's up in the air who the Colts will play as of this writing, but Indy definitely has some momentum going into the postseason. They're looking more like the team that started the season than the win one/lose one team that started games slow and couldn't find any offensive rhythm. The only thing that gives me pause is that the competition hasn't been stellar. The Texans (2-14) cashed it in weeks ago and the Jags (4-12), while much improved from the week four meeting, aren't very talented. Only the Chiefs had a winning record. We'll see how it all plays out next week.